I have to say that writing on this blog really is cathartic. Even if no one was to read, I think I might still keep it up for a while because it is good to be able to think things through as you write them out. You know, the old adage that you don’t truly know something till you can explain it to someone else? It’s nice for me to write stuff, plus I also love being able to look back at my history & see not only what I have done and thought, where I was geographically and where I was psychologically. All those things that a photo itself might not capture. That said, I have to admit that it’s not all just about the internal stuff.I do love the comments too. I have one of those lovely little statistics things that tells me that there are between 150-200 “unique” hits are received a day (that is, not just the same person coming again and again, or visiting multiple pages). Occasionally I find myself wondering “If there are so many people who read, how come I don’t get like a billion comments? Some people have said that they like to read, but they never really feel like commenting. It is more of a voyeuristic thing than it is an interactive thing. Others have said that they never know what to say, so they figure that it is easier to say nothing than to say the wrong thing. Others…. well who knows. Of course, it’s nice to know that lots of people like to visit my site, and it is flattering to know that there are more people out there than those who leave their own finger print on the site, but sometimes I have been curious & I have tried ways to get a little interaction. I might pose a difficult question, make a serious statement, or delve deep into my confessional box. Sometimes it has worked OK, sometimes it hasn’t. Well tonight I have the perfect excuse for you, dear reader to leave a comment. You don’t have to say something profound. In fact, if you want, I could even draft your comment for you (though original works will certainly be appreciated too). Yes, Jacq, you are the first up! Congrats on that! I don’t have a close-up picture of the ring yet, but rest assured, as soon as I get it, I will make sure I post it! Even better, maybe I should try & exchange some Yum-Cha company for detailed info & discussion? Massive news, very excited for you both. On that note we’re heading out for a celebratory ale, looking forward to catching up and meeting your fiancée soon. Swweeeeet… Great news. Great news. woo hoo! Congrats. So v stoked for you. Congratulations! I actually saw it on Flickr first!! Haha! I agree with Jacqui, need a close up of the said ring! Ok – I just took the biggest double-take on that dude!!!! Get outta here – that’s AWESOME!!!! Congratulations, these are happy days indeed! WOW! Congratulations!! I want to hear your story!!! I’m super-hyper-über-happy for you Tim & Shona!! Praise God for bringing your two paths together. 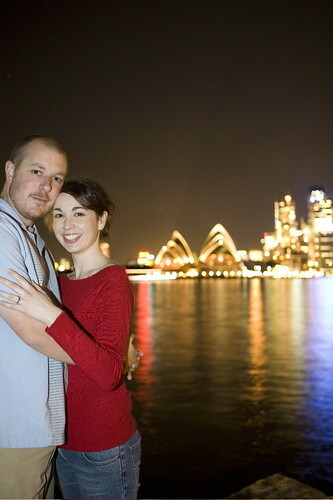 I must admit, I’m one of those voyeurs (I love looking at your photos, and scanning for SMBC friends / fiancés). See you soon! You know we’re ecstatic! Congratulations to you both. We’ve already got Charlotte practising… “Auntie Shona”! Congrats! Is your ear still ringing? I know that I already said it over the phone; but just so you know that I am one of your ‘billion’ readers…… congratulations! I rarely venture to comment, but who couldn’t with this good news?! PS. How gorgeous is our goddaughter at the moment?! She grew up so much while they were away!! A BILLION times – Congratulations!! Well done Tim, not letting that gorgeous girl out of our lives. What a great addition to the “gang”. Awesome, fantastic news and congrats. Congratulations to both of you! It’s awesome to see you so happy! as one of those often-visitor-rarely-commenters, i would like to say THAT’S FREAKIN AWESOME! it’s been fun to watch you blog about your romance (just think of me as your friendly internet stalker). i am smiling double right now to make up for your bemused look in the photo. how prophetic that you wrote only a few days ago that ‘everybody is somebody’s weirdo’… now you can be shona’s. awww! that is sic news.. but i may have had a little heads up! stoked you’ve found your life long lady friend! God is good!!! Your are the beaaaccch. Well played mate. Could not be a more deserving fella. I hope your kids are wheat bix kids. Chloe told me @ College about the big news – thought I would find a post on it! Congrats brother – shes a great woman – you have chosen wisely. May God bless you both richly in the future that He holds solidly in His hands. I should have asked you why you looked so happy this morning despite having exams! Now I know the answer. Excellent news – congratulations! Loved meeting Shona on Sunday. Though I think it may be tough topping an engagement…oh well..least you know you will get a few comments after the wedding. Take it easy mate and welcome to marriedville…not a bad place if I do say so myself. It’s fantastic news… God is very good to have brought you two together, although I’m pretty sure we had a deal with Shona that you couldn’t get engaged until we’d formally met you! Oh well – now our chances of dinner are even less now that you’ve got a million well-wishers at your door. That said, this site has been an excellent tool for keeping track of what she’s up to, and given that she now has a ring on her finger, we can be assured that we’ll be able to keep track of her here for many years to come. Thanks for providing such an excellent service. You really did score all round with this one. and another congrats from me!! You just gotta love an early birthday present of that calibre. Shona got you a fiancee. Excellent! Well done to both Timmy and Shona. Of course, I have already said congratulations, and I already do comment occasionally, but I feel the need to contribute to this record number of comments. We are all thrilled and can’t wait to welcome our new sister and auntie into the family. Glad I didn’t have to wait long after lunch for this news. CONGRATULATIONS to you both!! but really how could she say anything but yes to a great guy like you.